There are no low-end iPhones or iPads. They are all premium products that sell into premium markets. By and large, people who buy products running iOS can afford to support the ecosystem, and they do. The vast majority of Android devices are budget devices sold into the budget market. Their buyers generally cannot afford to support the ecosystem with aftermarket purchasing, and they don't. To put it another way, iOS owns the profitable segment of the market. In business, that's the segment that matters. Not only was most of the purchasing done on an iOS device, the amount of the purchases was higher, $131 v. $111. This is not a knock against the people who use Android. It is a statement of fact. People who drive Mercedes spend more during the holidays than people who drive Fords. It is a function of where the money is. The other part of the equation is trust-share. Which platform do people trust when it comes time to hand over money? Again, that would be Apple's iOS, hands-down! Almost nobody is crazy enough to enter credit card information into an Android device. Are you kidding me? That is like sticking your head in the mouth of a hungry lion to retrieve a penny. It's just not worth it. The risk is far greater than the reward. By now, everybody knows that the makers of Android, and the sellers of Android devices could care less about your privacy, and the security of your personal information. An ungodly percentage of the apps in the Android Marketplace exist for the sole purpose of stealing your data. Even Android fans would have to be crazy to trust their devices with critical information. Apple owns the trust-share, and for good reason. Everything about Apple's business model is respectful and protective of user data. They simply have no incentive to extract and exploit your personal data. Google, on the otherhand, is an advertising company. Everything they do is for the purpose of extracting and exploiting personal data. It is little wonder that Google attracts developers that feel the same way. If you are an Android user who likes to do a bit of mobile shopping, you might want to pick up an iPad, you know, for those times when security really matters. 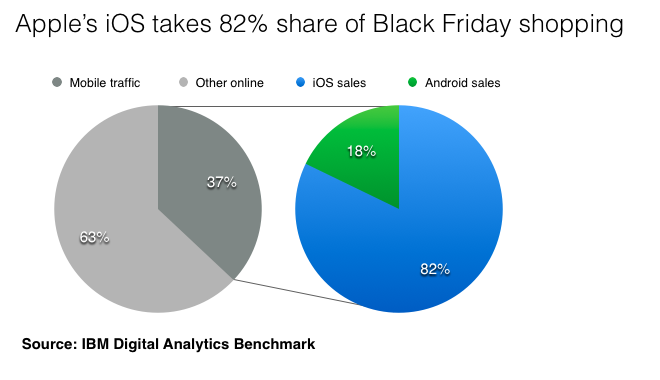 Newer:If Black Friday is any indication, it really is going to be an iPad ChristmasOlder:Why are we dying for Black Friday with Cyber Monday right around the corner?